Be still in the Presence of the Lord, and wait patiently for Him to act. Well, we sure have had a whirlwind of excitement over this past weekend. I do recall God told me in January, it would be a month and YEAR of SURPRISES!! He wasn't kidding! Our landlord text me on Thursday and said he was bringing someone by on Saturday morning to look at the house we live in. The house hasn't been on the market. This came out of left field. Saturday morning they came as planned and within 45 minutes the house was SOLD!!! The plot is thickening!!! God loves to increase the suspense, doesn't He? We have been in this rental for the past 3 years (in September) with NO lease. We've been just month to month knowing that at anytime God could shift us into our "Promised Land". Our landlord has been awesome. 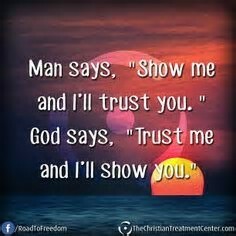 He is trustworthy, attentive and has always taken good care of us. 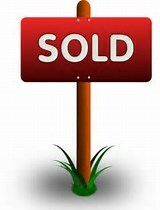 Selling of the house is no exception, at least that we know of. He has said to us that the new owners would be required to lease to us and not raise the rent as long as we needed a place to stay. The only catch is, that we sign a year lease! That is not something we are comfortable doing, especially since we believe that God is about to shift us. I do thank God, however, as that may be just His grace giving us piece of mind while HE works out the final details for our move? Only He knows that for sure! This past week the Lord has been speaking that NOW is the TIME to enter into the fullness of His promises! I keep hearing It's Time!!! It's time for healing. It's time for the next step in our adventure with Him, and it's time to GO!!! There are a bunch of prophetic voices confirming what we are hearing.... and it's quite reassuring! Here's one that came in on SATURDAY - the very day everything happened on our end!! "Here It Comes! Your Time is Now!" Your Appointed Time is Upon You! It is time to stand and be ready to do the things the Lord has placed within you. He is causing the words spoken to Jeremiah to echo in your spirit, beckoning you to stand – stand free of insecurity, free of doubt – full of confidence that He, the Lord, shall go with you. You need not fear man and what they will say about you. The Lord God has placed a fire in your heart that burns to release the Kingdom of Heaven on Earth to all those He places in your path. He will fill your mouth with the words He desires you to speak, He will enable your hands to do the work He has called you to do, and He will strengthen you to walk in the confidence of the Lord! You need only to stay focused on His Word, His truth and His voice – all else will fall into place and anything that is not of Him shall fall away. God does not place a desire in you to fulfill His will so that you can simply put it aside out of concern that you are incapable in the eyes of others. He places that burning desire there so that nothing except doing exactly what He has asked you to do will satisfy your spirit. You long to please Him and Him alone. Because of this, He makes all things possible even when they seem impossible. Ready yourself in your spirit and be prepared in the natural to receive all that the Lord has in store for you! Many things are about to fall into divine alignment that will create an ease to settle over your life. He does not set us up for failure, but provides all that we need to have victory in Him. He will cause your life to become one that will draw others in as you carry His light where He leads you. You shall lack nothing in the natural because He has made you whole in the spirit! This is a walk of faith, but your Father in Heaven is faithful. He takes pleasure in blessing you in this lifetime. His favor is falling over you like a waterfall. He is pouring out His glory from Heaven so that you may share it with others. The changes He has made in you and your life will be recognized by many, and His grace upon your life will be undeniable, causing others to crave their own relationship with the King of kings. On a recent morning, the Lord highlighted the Scriptures of Jeremiah 1 to me. I heard the voice of the Lord say, "Here it comes!" My spirit became excited – jumping within me – as the revelation that all of His preparation over the years, all of the trials we have had, all of the pain we have endured has brought us to this moment where He will be magnified as the One who provides and cares for those who love and serve Him. "I Have Carried You Every Step of the Way"
"Rise today in confidence that I knew you before I formed you long ago in your mother's womb for My purposes alone. I have carried you every step of the way. Although you have experienced painful circumstances and at times even trauma, I have hidden you in a place of safety in order that you would not be crushed – only pressed into a vessel made perfect to carry My glory. "You have reached your kairos time in which favor and blessing will pour upon you. You will be recognized by others as set apart for My purposes. Many will be drawn to you so that they may be given new hope in a life that has seemed hopeless to them. You shall reflect My light into their lives, so that they may see the beauty I am able to create from ashes. "Do not be afraid when others do not receive you. For they will hear what you are saying and although they appear to not be listening, your message will echo in their spirits until it cannot be denied any longer. Your life is marked with My goodness and although it does not relieve you from difficulty and hardships, I have covered you in My grace and goodness so that you may always prevail in victory over all things. "I am saying to you, 'Here it comes!' You will witness My power and favor come upon you like a tidal wave, bringing unbridled joy to your days! You have been faithful in your pursuit of Me, it is My time to give to you abundantly as you step into the plans I have for you! Mark My words, you will stand in awe of all that I have for you! HERE IT COMES!" Anne Marie Molster is a prophetic writer who desires to share the heart of the Lord while encouraging others to step into the secret place that He has reserved just for them. She carries the gift of a seer who is given visions and dreams that speak into her life as well as the lives of others. By stepping into His presence, she is able to hear of His love for His children and His great plans for them, which she then shares through a written word. By sharing her encounters, she desires to bring others into a deeper relationship with the Lord, so that they understand that they too can hear His voice and experience a relationship that surpasses all others. She longs to help many step into the Kingdom to see all the amazing gifts He has prepared for each to enjoy. He was not a young man. Yet he cried "Give me' because he had fulfilled all that had been required for such a time as this! It is now his time! It's time to cry out GOD I've done this for you NOW GIVE ME MY INHERITANCE! MY PROMISE! MY PLACE! It's Now Your Time to ascend the hill of the Lord (Prov 23) and RETRIEVE the promise GOD has given you. This is by no means an arrogant cry. It's a righteous cry.. because we have been mandated to do certain things for the Lord on behalf of his Kingship. The Lord is King and The King Requires Your Presence to fulfill the role you are to play. We still don't know how or when this will all take place, but there is such an excitement in the atmosphere that things are in motion. God is a God of SURPRISES!! 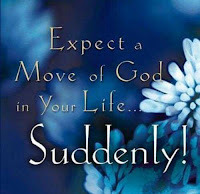 He will show up when we least expect it - and yet - we are EXPECTANT and full of ANTICIPATION! Though these next days and weeks may be a little nail biting, we are confident in the Lord's goodness and His grace to help us crossover. We are standing at the bank of the Jordan, seeking the Lord on how to step in and watch Him part the Red Sea! Ken - Praise God Ken has picked up 2 days a week (at least this week) doing some interior painting. We are so thankful for the extra work/income. This will help lessen the gap. Please pray for his endurance and stamina as he will be working 6 days a week with this and his other job. Please pray for his health. He's been having back spasms from lots of heavy lifting. Michele - Praise God for He is good. I am still contending and believing that I will be healed by the Lord. Please continue to pray for breakthrough in the area of sleep specifically...for both of us... and for pain relief - knee & low back. When I sleep, my energy levels are good. Canyon - He has given us a few scares thinking we might be putting him down. It's amazing that he keeps bouncing back and his still plugging along. Please pray for grace - when it's time to put him down, that there is no trauma for him or us. Ministry - Praising God believing that God will bring us into the fullness of our purpose, call and destiny SOON!!! General - Praise God for His faithfulness! We have had several friends here bring us vegetables, fruits and even eggs from their bountiful gardens! What a blessing!! Though in the natural our provision is not enough, God is enough and He takes good care of us! Yes Indeed, It Won't Be Long Now! Do you dream? Do you remember them? Do you understand their meanings? Most often dreams are symbolic in nature. They carry a weightier meaning than what you saw. 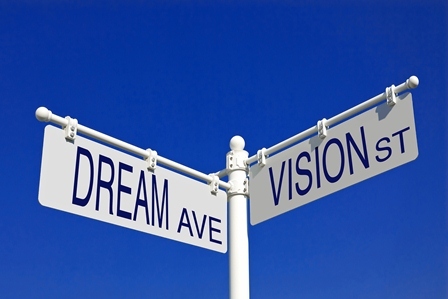 What about a vision? Visions can be both with your eyes open or closed. These typically are more literal. What you see is what God is actually wanting you to hear. 1. a series of thoughts, images, sensations occurring in a person's mind during sleep. 1. an experience of seeing someone or something in a dream or trance or as a supernatural apparition. a. a vivid mental image, especially a fanciful one of the future. Do you believe God can speak to you through a vision or a dream? The Bible, shows that God spoke to people often through a vision or in dreams. Last blog I wrote about a vision/dream that I had and one that Ken had. What I didn't share with you was that we are both experiencing such an influx of dreams and visions over the past few weeks. The few hours I get a night are filled with very detailed dreams. Ken is often having several dreams in one night. We seek the Lord for insight into each dream/vision and then also submit to a few people we know and trust that have history of accuracy in dream interpretation. These dreams have been coming fast & furious! When Ken & I started dating in 1984 there was a pinball machine called Eight Ball Deluxe. We used to play it together not in competition but together playing the same game. I used to play the left flipper and Ken played the right. It was a true sense of teamwork. Interesting that as the years together (now 33) our marriage and how God speaks to us is quite similar. I will often hear something and at the same time he will get a picture or vice versa. Over the past several years more & more prophetic words have been spoken over us about being a dynamic duo, powerhouse together, mighty ministry couple etc. We recently had a word that together we would walk in the office of a prophet. (Thats up to God and we are not striving for or need a title-but we do love being used by God to minister healing & encouraging words) It's kind of fun to get these but even moreso knowing that is how the Lord speaks to us and through us. Revelation & confirmations are happening so fast we can barely keep up. We are DEFINITELY in a season of Amos 9:13-15. This is a verse the Lord first gave to me last year to encourage me of things to come.....and has since repeated it to me multiple times (and many other prophetic voices) this year. So what's this have to do with Eight Ball Deluxe and a pinball machine. On the game you have to be paying attention...when you hit the ball with the flipper you aim to be precise, the ball bounces back & forth side to side. It's a game of strategy and positioning the ball just right. Kind of like being in the right place at the right time. So, I believe God is releasing strategies through Dreams & Visions so that we are where he wants us to be figuratively and literally for this next move of God. One more thing..... the Eight Ball Deluxe Machine has a saying it speaks out while you play "Stop talking & start chalking) meaning quit talking and take action. Or in baseball, they say let's play ball, in racing start your engines. I don't want God to stop talking however I do want to see ALL He has promised manifest soon! These verses also speak to me the PROMISES He has spoken will come to pass. It also speaks of our waiting season. We wait and wait and wait and wait and wait.......... and then SUDDENLY God does the MIRACLE you've been contending sooooooo long for! We've been in a wilderness season almost since our inception of becoming a believer in 2002. He has been preparing us, grooming us, purging the old to prepare for the new! The Lord willing, we feel we are ready to step into "destiny." The shift has happened, things are beginning to pick up momentum!! “Yes indeed, it won’t be long now.” God’s Decree. "They'll rebuild their ruined cities. They'll plant vineyards and drink good wine. They'll work their gardens and eat fresh vegetables. And I'll plan then, plant them on their own land. (P.S.) 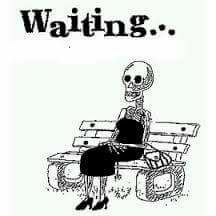 If you are waiting on God for something... I believe this verse is a rhema word for you! Grab hold of it = contend for it! It's yours! There is a friend we met a couple of years ago. He moved from KC to Eldo and lived here about a year. We connected with him and instantly bonded both as a friend but also as someone we thought God may be connecting to us and our ministry. We often prayed with each other, for each other & for Eldo and surrounding communities. Our prayer times were powerful and filled with fresh revelation, power and breakthrough. We saw answers to our prayers quite often. Well, he moved back to KC and our relationship was still there, but obviously limited. In January, he sent me a text with something that really began a ball rolling in a direction we never imagined. But, the funny thing is, that was the LAST communication we had for 6 months. It was like he vanished off the radar. In those 6 months, God has been speaking to us very specific things, so many things, that I had to create a folder in my laptop trying to keep everything somewhat organized. (I could write a book with all of it). In June, I sensed the Lord prompting me to reach out to him again, so I did. He responded....as if there was no separation at all. Without revealing too much, we believe God kept us apart so He could speak to each of us separately. What we didn't know during that time, was that God was speaking identical things to each of us. When we reconnected, wow, things that we heard for the past 6 months, he was hearing exactly the same thing. Every day now we connect. It's almost creepy (in a good way), but I can message him something and he will be looking at the very same thing. Or we've all been seeing numbers/having visions & dreams that have very specific biblical meanings that are applicable to what God is doing with the 3 of us. What we see or hear from the Lord he is and vice versa! It's amazing! Now back to Amos 9 - all these things - dreams, visions, numbers, times, prophetic words, posts, quiet time thoughts and impressions are coming so fast. Literally, the 3 of us have often been overwhelmed in a good way. But, as the verse says, so fast our HEADS WILL SWIM! I can't keep up with copying and pasting and typing out what we're hearing. I know I am missing key pieces. Our friend is even trying to create/keep up a graphic for us. So that leads me to the title of this post. "Yes indeed, it won't be long now." We believe this verse is being played out right before our eyes. We still don't now HOW or WHEN, but we are trusting God, contending, decreeing, believing and standing in FAITH! -God is good and faithful to meet our every need. This past weekend a friend of ours lives in a semi-nearby town which has an Aldi's (our closest one is an hour away). We didn't want to go that far from home because Canyon was having a bad day and we weren't sure if we were going to have to put him down or not. I called my friend and asked if he would mind stopping into Aldi and picking something up and bring to us the next day when he was coming for a visit. He was happy to help us out. He surprised us and blessed us by not only going to the store for us, but paying for it and not letting me reimburse him. And he blessed us with 2.5 doz organic, non-gmo eggs & 3 cucumbers from his garden! What a generous and kind man!!! -God is good and faithful - Canyon bounced back from a horrible few days. We don't want him to suffer and yet we just don't have peace about putting him down quite yet. It's very possible it could be any day. Our prayer is that God would take him peacefully in his sleep, with no trauma to him or us. We've been blessed that he's lived as long as he has 15.9 years (and his lifespan is only 10-12 years). - God is good and faithful - Ken somehow survives the limited sleep he gets on Monday and Tuesday nights mostly. (Matter of fact he's trying to sleep now and since I can't, I'm in the other room writing this). God's grace is sufficient in our weakness. Please continue to pray for the grace to endure & provision to come forth. -God is good and faithful - I'm thankful that even know my sleep is still not consistent or often, that somehow God's grace gets me through. Pain levels are still high but I cope. The enemy still often lies to me about the consequence of sleep deprivation and likes to attempt to put fear on me, but I am gaining strength and confidence in God's Word and believing what God said - HE WILL SUSTAIN me. I trust that as we are stepping into DESTINY (soon, we hope) that my health will be fully restored. I am seeing improvements. - God is good and faithful - our weekly meeting is still going strong. Mostly our ministry in this season is to the Lord, in intercession and ministry to those He puts before us. 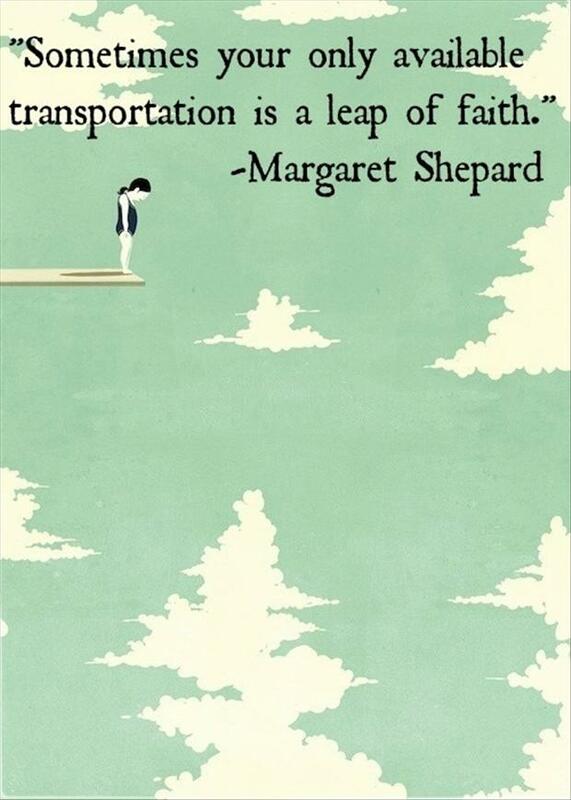 Is God preparing you to take a leap of faith? Is He asking you to do something that may look foolish to the world, your friends or family? 2 Corinthians 2:14 But thanks be to God, who always leads us as captives in Christ's triumphal procession and He uses us to spread the aroma and knowledge of Him everywhere. This past week.....Ken and I both have a strong sense God is about to ask us to take a leap of faith. We are not sure what yet....but through our quiet time, devotionals & dreams, we feel He is preparing us. Here's just a little bit of what He has been showing us. Two mornings ago as I was awaking still half asleep I had a vision of a beautiful black & blue sky. The stars were too numerous to count and lit up the sky. Then 3 brilliant rainbows appeared in the sky. I asked the Lord what did this mean. He said that the Abraham covenant is still very much applicable as we have been grafted in. The 3 rainbows He said were speaking of 3 distinct promises He had spoken to me were being FULFILLED NOW and 3 NEW promises He would give me. When I turned on my phone a Facebook friend had sent me the picture of the verse here. The friends name is Abraham and the verse talks about the covenant God made with Abraham. CONFIRMATION!! There is so much more to this that I am still getting but sharing the highlights. Ken had a dream a couple nights ago. He was holding a window frame and putting it up in a moving truck or van. As he was putting it up, he said, this is the last one. It's time to go. I felt the Lord showed me that the window, is the window of opportunity, the kairos moment that God is offering us. When we step into that, the doors to the dream He has given us will swing wide open. Yesterday the Lord put such a stirring in my spirit. We began listening to and even posting a few songs that the Lord had placed in our hearts for the VICTORY He is about to bring forth. I believe the VICTORY is for you too. The Ekklesia has been contending & travailing for a very long time. There are promises that God has spoken to each of us and I believe we are entering into a KAIROS season for those to be fulfilled. However, there may be one condition - and that is do whatever He asks you to do! I had worked laboriously for an “open door” to Channel One in the nation of Ukraine — the premier TV channel that broadcast into every home in the country. However, regardless of how hard I tried, it seemed that access to this massive station eluded me. But one day, I received a phone call from a man who said he had an “inside” contact at Channel One and that if I would meet him at a certain location in Kiev, he would accompany me to the station and introduce me to the top leadership of that channel. So at the appointed time, I met him — it was almost like a clandestine operation — and he did exactly as he promised. He walked me through the open door that I had been seeking for years. I almost lost my breath. Did they really say what I just heard? Were these men actually offering me the possibility of broadcasting our programs to the entire nation every day of the week? As far as I knew, this opportunity had never been given to anyone else. But now the door had flung wide open and was standing right in front of me as open and passable as it could be! This was a God-ordained moment. I knew that God was beckoning me to trust Him and to walk through this door. After reviewing the contract, I took a pen in hand, gulped a deep breath, and signed that piece of paper. It was a huge leap of faith for me, but I had the awesome inward witness that we were about to experience the supernatural provision of God in a measure we had never seen before. God was going to show Himself strong to us and provide every cent that was needed to broadcast on this massive TV channel. As a result, every person in every home in that nation where there was a television would be able to hear rock-solid Bible teaching every day of the week! When we later looked at the calendar and compared the times on both sides of the world — we discovered that at the exact moment I was signing that contract, this woman was receiving the news about her inheritance! I signed the contract, and literally simultaneously, God put the money into the hands of a widow who had made Him a promise. Before the first payment was due for that massive TV outreach, we had all the finances we needed to pay the bill. God had entrusted that widow with the money necessary to cover the cost of those first broadcasts — and she kept her promise to steward her finances for the preaching of the Gospel. Actually, this woman supported our TV outreach for many years. As a result, our Bible teaching programs went into every home in that nation every day. Over time, we received millions of letters from people who watched the programs, who gave their lives to Christ, and who began to regularly correspond with our ministry for help to further develop their lives in Christ. Paul knew his role was that of a “planter,” which is the Greek word phuteuo and means to plant. Paul’s statement was a clear reference to his founding of the Corinthian church. He was anointed to forge into new territory and challenge the powers of darkness in order to plant. Paul was endowed with the anointing to push open doors and find opportunities — and to plant seeds for the Gospel that would grow into churches. Apollos, on the other hand, was anointed differently for ministry. He was specially called to come behind Paul and to “water” and “nourish” what Paul had planted. The word “watered” is the Greek word potidzo, which means to give drink, to water, or even to imbibe. It portrays one who nourishes what has been planted, thus providing the sustenance it needs to grow. Of course, we know that God ultimately gave the increase, bringing forth what Paul planted and Apollos watered — and causing growth to come in the Corinthian church. As I look at First Corinthians 3:6, I see these three elements in the Channel One miracle: First, I was the planter who was anointed by God to sign the contract. That was an essential first step. Second, our blessed partner, a widow, was called and anointed to “water” the seed I’d planted (the signing of the contract) with her finances. She was assigned a very important portion of the process, and she willingly did her part. The word “increase” in First Corinthians 3:6 is a form of the Greek word auxano, which simply means to increase or to grow. The form of this word used in this instance indicates the continuous blessing of God upon the work of Paul and Apollos, with God as their chief Partner in the process. It simply takes every one of us doing his or her different job — with God’s blessing on it — for doors to open and harvests to be reaped. Divine connections are essential for completing a divine assignment. And respect for every person for the role he or she plays — including God and His role — is so important. Most of us realize that even if we all did our respective parts to make supernatural things come to pass, nothing of value would ever grow without God didn’t provide His continuous blessing. So all the glory goes to God for what is produced in our lives. In the case of the contract with Channel One, after that man helped me make contact with the leaders of that TV station, God used my associate and me to negotiate the deal, my hands to sign the contract, and a widow to sow finances into the project. And, most importantly, God’s hand of blessing was on it throughout the entire journey. Those elements all working together produced a harvest of salvations from our TV programming that will last for all of eternity. If you’re trying to complete a God-given project alone, I pray that today’s Sparkling Gem has spoken to your heart about the need for divine connections with other people — and the absolutely essential need for God to be your chief Partner in making everything you do grow and become prosperous. If you do not have those connections right now, I pray that God will divinely connect you to others who will join to help you complete the assignment He has called you to fulfill — in Jesus’ name! Today, this is what I felt the Lord say: My Child, everything is in place. Soon you will go. I have lined up all the details needed to make this promise come into fulfillment. My provision has been released. It is en route. Your inheritance is on its way. In the days ahead, I will ask you to take a giant leap. You know my voice. You can trust what I speak. When you take the leap, when you take that step, I will part the waters. You will not drown. I will not fail you. Keep your eyes on me. Now is the time!! Sing your victory song. God is good! He is faithful! We are so thankful for those of you who pray for us and believe in what God is doing in us. Could we ask you to please pray for the "open door" for us to move into all He has for us. We feel our wilderness season has ended and we are moving into the next. Prayer request - please continue to pray for daily provision! Our income is only about 30% of what we need. Pray for Ken's endurance....it is getting harder to get up at 3am for his shifts, especially since sleep is an issue. Pray for my health. And Canyon, we are seeing more signs the end is getting closer. Thank YOU to those who email me prayer requests. It is such an honor to intercede for the saints.